It is a truth universally acknowledged that quilters love fabric. And, why wouldn’t we? Fabric is utterly desirable. The beautiful colours, sumptuous prints and endless possibilities set our pulses racing. There is nothing wrong with loving fabric. 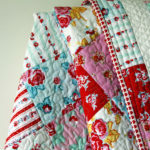 In fact, as a quilter, it is totally necessary to love fabric. But our love of fabric can become a problem when we buy far more than we need or could ever use in a lifetime. Many quilters will buy two or three metres of a can’t-live-without fabric when half a metre would have been sufficient. Or, perhaps – three jelly rolls when one was enough. At the time of purchase we justify the extra fabric by telling ourselves it will come in handy. Ha! Let me tell you (with the knowing-voice of experience), those particular must-have fabrics will haunt you for years to come, because once you’ve used them in a quilt, chances are, you won’t want to use them in another quilt. I promise you, your tastes will change, fashion will change, and you will never have enough places to hide your excess fabric. Why buy one jelly roll when you can buy three? Don’t get me wrong, I’m not talking about the amounts that are listed on a pattern, nor the subtle backgrounds and stash builders. I am talking about the whopping-great lengths of feature fabrics that we think we must need to make a quilt. The truth is, many quilters have no idea how much fabric is used in a quilt, but don’t worry, I’m here to help. 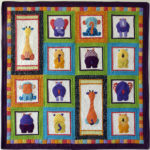 Note: The amounts quoted are for the quilt top and binding only – not the backing. 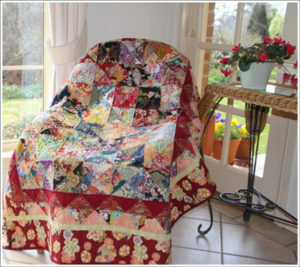 You may have noticed that Garden Pleasures is a similar size to Kiku Blossom and yet uses more fabric. This is because it has smaller blocks with more pieces. The more pieces you have the more seams you have. Kiku Blossom has larger blocks and pieces, which means fewer seams. There are nine different fabrics in Kiku Blossom. If I’d purchased one metre of each of the fabrics I’d now have four metres of left-over fabric. It doesn’t sound like much but it adds up. As tempting as it is to over-buy, I’d rather make more visits to the fabric store to see what’s new than to have to use the same old fabric. 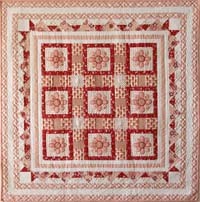 For me, each new quilt is an opportunity to start fresh and get the creative juices flowing with fabrics I’ve never seen before. How much fabric you buy is your choice, but once you have a rough idea of how much a quilt actually needs you might find that less is more. 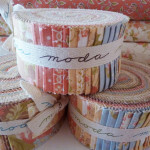 By the way, does anyone want to buy a spare jelly roll or two? Did my husband call you complaining about all that fabric I brought in last Sunday? Don’t mind him. He’s a derelict and a drunk……wait a minute……no, no that’s me. Loved the article and I am a prime example of the person you are referring to. So enjoyed opening my emails today to find this from you. Your flower banner is very pretty as well. Keep them coming. I enjoy reading them. Yes, he called for an intervention. Fabric this week…. Next week, during happy hour, we’ll work on your drinking issues. Thanks for you comments. You always make me laugh.